KB2952664. Here We Go Again! Oh dear This appeared AGAIN, today in Win7 updates: it's 'optional'..now I have a pair hidden..
Free update blitz part 2 on the way? @FWIW If anyone wants to update to 10 I believe this still works..
Also don't forget, that installing every "Monthly Rollup", starting with KB3192403, will also install botnet (aka diagnostics, telemetry and data gathering). The only workaround is to force disable Windows Autoupdate checking and manually install only the "Monthly Security-only updates". I just checked Manually & it (KB2952664), was there, again. Hid the beast once more. The monthly roll-up KB3214626 KB3212646, Security updates I let install. For Jan, 12th... KB3205394. Security updates. & Jan, 13th... KB3212642. " " " " " " "
but unfortunately it's whole "Monthly Rollup", not just "Security-only update", which is KB3212642. KB3212646 has telemetry thing included per including all fixes from: KB3207752, KB3197869, KB3197868 and KB3192403, which was the start of the cumulative telemetry thing. Aww...Just got KB 2952664 ..again. Yes BUT, MS say that it's got nothing "nasty or intrusive" in it. Will watch for it, next time I check. KB2952664 AGAIN...... "Don't these people ever give up" ! "They're" still pushing the "compatibility checker", according to woody dot com. From his site...ref; > "Office non-security patches appear with the reprise of KB 2952664 and 2976978." "They" might just be trying to hide it under a false name? The updates to Windows 10 end on December 31st. Its probably a last pass effort before they stop. mightyglydd wrote: KB2952664 AGAIN...... "Don't these people ever give up" ! 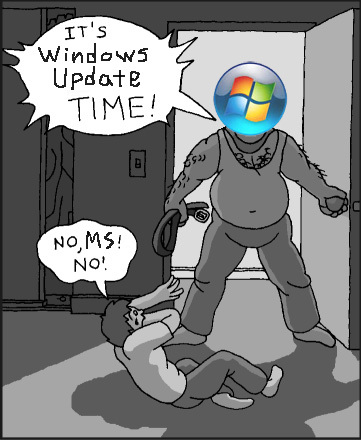 Just saw it my current Windows 7 update. Just wondering if they'll ever get the message!